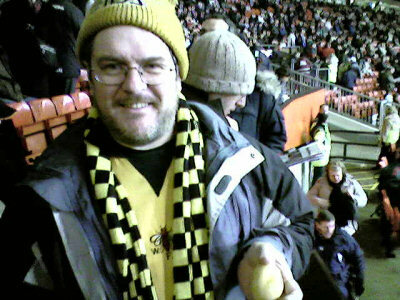 Posted by Ian Grant in Five-a-day Awaydays. It would appear that most of you were much too busy fluttering your eyelashes at Tommy Mooney for any five-a-day fun…although we note and applaud Frances Lynn’s attempts to get the great man to take part. Anyway, to business…. Pete Bradshaw, apparently sitting on the same row as some very, very small people. 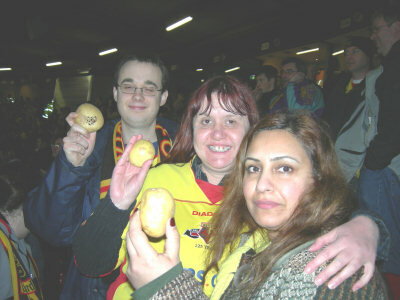 Chris Stride, Sarah Anderson and a spud-shaped steward for an excellent bonus point. 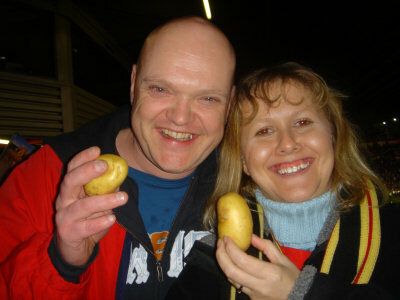 Jeff Bartrop, who is to be applauded for finding a potato that appears to have some sort of unpleasant disease (might it be bird flu? OHMYGOD, IS IT BIRD FLU? SAVE YOURSELVES! RUN FOR THE HILLS! ), along with Celebrity Big Brother contestants Frances Lynn and Farzana Chaudry. 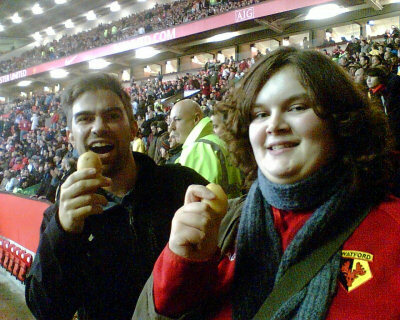 Cate Lynn – sister of Frances – and her fiancé Nigel, looking suitably excited by a visit to the Theatre of Dreams (TM).